Volunteering continues to enjoy high recognition in society and enriches the lives of many people. Here you can learn and practice key qualifications in the fields of counselling, free speech and dealing with people for work and everyday life. You have the opportunity to get involved in a committed team with your creativity and to design your own place in the Rosa Hilfe. every now and then on Wednesdays, two hours a night. You find yourself in the description and have become curious? Then please take 1-2 minutes to fill in the contact form below. 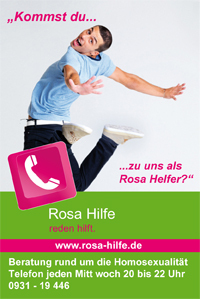 The Rosa Helfer is already looking forward to meeting you. Have you already had experience? What motivates you to give voluntary advice?